Irrelevant note: Good job to all 10 owners for making at least 1 post in the past 10 days. A new cycle starts today. 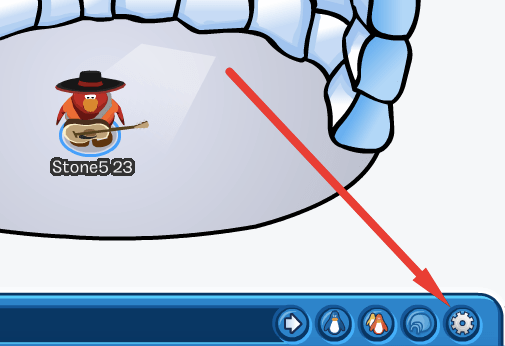 Welcome back to our CP Cheats series. Yesterday, I came across a video by CPWorld showing you a cool trick to remove your username from underneath your penguin, and I thought I’d try it out. Continue reading to learn about the trick! As you can see, not only does your name disappear, but everyone’s usernames disappear as well! Though it’s obviously client-sided, I think it’s a neat trick especially since you don’t need to download anything to do it. Anyone can do this at any time in under 10 seconds. Here is how it’s done! Step 2) Click and hold in the top left corner. Step 4) Close settings, and you’re done! If you want to go back to normal, just do the trick again. Once again, this “hack” is client-sided, meaning the usernames will only disappear on your screen, nothing will change for anyone else. It does make me wonder what other secret codes there are like this one. Hope you enjoyed this brief post, and comment what you’d like to see next! That is quite interesting. I will probably do that. on second thoughts maybe not as it would be harder to identify each troop which attended :l … there’s a downside to everything. we could use to hide multilogs, you mean..